Megan Snow says that getting a close-up view of an Air Force F-16 fighter jet being refueled in mid-air was a totally thrilling experience. She was sprawled on her stomach in the tail of the refueling plane, with the F-16 just 20 feet away, going 500 miles an hour. Next to her was the airman manning the boom that fed fuel to the fighter plane. “It was just amazing,” Megan says. And yet that experience, thrilling as it was, was really just another day at the office for Megan. Building and maintaining close ties to the military is one of the many things she does as executive director of the Greater Inland Northwest Chapter of the American Red Cross. 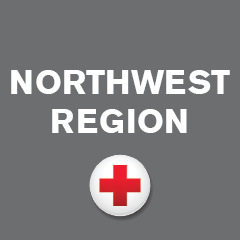 The chapter, one of seven that make up the Red Cross Northwest region, is headquartered in Spokane WA. And Spokane is also home to Fairchild Air Force Base, where the 141st Air Refueling Wing of the Washington Air National Guard is based. That’s the unit that staged the refueling mission for Megan. The ties between the Red Cross and the military that Megan works hard to maintain go back a long way, to the founding of the Red Cross by Clara Barton in 1881. Barton was a battlefield nurse during the Civil War. These days, there is almost always someone from the air base on Megan’s board of directors, and her chapter aids members of the military through the Red Cross Service to the Armed Forces (SAF) program. In addition, Brigadier General Jeremy “Java” Horn, commander of the Washington Air National Guard, sits on the board of the Red Cross King County chapter in Seattle. The 141st Refueling Wing is one of the units under Horn’s command. What sets Megan’s chapter apart is not just its proximity to the Air Force base, but its sheer size. Not only is it the biggest among the region’s seven chapters but it is, Megan says, “one of the biggest in the whole country in land area.” It stretches across 15 counties, covering not only the bulk of Eastern Washington but also the Idaho panhandle. Beyond the main office in Spokane, there is a satellite office in Wenatchee WA. Spokane has around 220,000 residents, but much of the chapter is sparsely settled—often with limited high-speed internet service. Megan says the chapter responds to disasters around 250 times a year. Most, she says, are small-scale responses—such as fire in a single home. But the demand for volunteers to assist at wildfires has grown dramatically in recent years. Given the way residents are spread out in the chapter, it becomes a challenge for Megan and her team to pull together the 300 or so volunteers the Red Cross will need at a major wildfire. Megan joined the Red Cross 10 years ago, as communications specialist at the Spokane chapter. She became executive director of the chapter four years ago. Wildfires have been a sad fact of life since the day she walked through the front door. They have plagued the whole State of Washington, of course. “But the biggest fires in the past four or five years have been in our chapter,” Megan says. The Carlton Complex fire in 2014, which burned more than 250,000 acres in North Central Washington, is considered the largest single fire in state history. The 2015 wildfire season was the worst ever, with more than 1 million acres burned. But in terms of requests to open shelters, the 2018 fire season was easily the busiest for the Red Cross. The season began unusually early (in April), lasted longer and produced a record number of fires. Megan says that based on the number of shelters opened, 13 of the 15 biggest Washington wildfires in 2018 were within her chapter. The notion of service comes naturally to Megan. So does her ability to communicate the Red Cross message throughout her community. She was born in Hawaii, where her father was on duty with the Army. She attended Gonzaga University in Spokane, majoring in public relations and communications. “My career has primarily been with non-profits,” she says. She took time off to get an advanced degree in communications. It was then that she first joined the Red Cross. Megan wanted to work for an organization with a big, well-defined, compelling mission. The Red Cross had a communications director job opening and Megan had the skill set to fill it. Public relations and communications are at the very core of an executive director’s job. She represents the chapter to directors, volunteers, donors and the public at large. She makes frequent public appearances on behalf of the Red Cross, but prefers talking to small groups or even just one-on-one.